The 2018 NBA Draft has come to a close. Future stars found their new destinations. The draft started with the Phoenix Suns selecting former Arizona center Deandre Ayton. 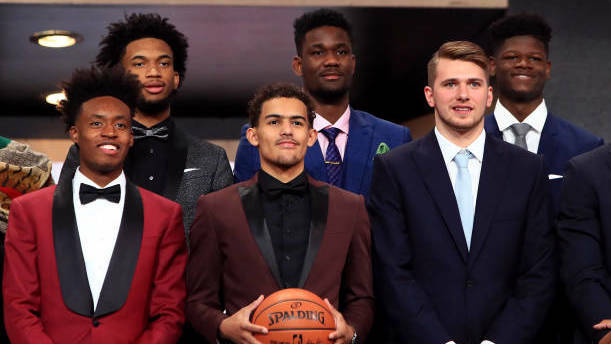 Coveted players such as Marvin Bagley III (Sacramento Kings), Luka Doncic (Dallas Mavericks), and Mohamed Bamba (Orlando Magic) were selected after Ayton. This year's draft gave us plenty to discuss going forward. Who were the winners and losers this year? Who were the steals of the draft? Let's explore these questions. The Suns' selecting Ayton was seen miles away. The Suns targeted Ayton for weeks. He is arguably the most ready player of this year's draft class. Also, the Suns landed Mikal Bridges via trade from the 76ers in exchange for Zhaire Smith, whom they selected with the 16th pick. Bridges was highly scouted and his draft stock was soaring. The Suns now have two new young additions to help build towards a bright future. After falling out of his projected draft slot, Michael Porter Jr. landed in the hands of the Nuggets at number 14. Despite stories pertaining to his back injury, Porter Jr. is a very coveted player who has a high ceiling. Porter Jr. He is a very talented player on offense and could one day lead the Nuggets in scoring. But, they will have to be patient as Porter Jr. is still recovering. The Mavericks were able to acquire young European stand-out Doncic from the Atlanta Hawks for Trae Young after the Hawks selected Doncic. The Mavericks targeted him before the draft and were able to get their man. Doncic has a chance to learn from future Hall-of-Famer Dirk Nowitzki and will develop nicely. Also, he will play in the same backcourt as Dennis Smith Jr., who had a good rookie year last year. With the ninth pick of the draft, the Knicks had a chance to select either Porter Jr. or Bridges. Instead, they draft small forward Kevin Knox (Kentucky). Although Knox is a solid player, he is not as polished as Porter Jr. nor Bridges. Knox's ceiling is lower than those two. His game will take a few more years to develop. The Knicks had a chance to draft a player who can make an impact immediately in Bridges. The Nuggets drafting Porter Jr. is the biggest steal this year but, there are other gems in this draft as well. One steal was the Boston Celtics grabbing Robert Williams (PF-Texas A&M) at No. 27. Williams was ranked 12th overall as a draft prospect. He has a great motor and is a machine on defense. Other steals include the Orlando Magic acquiring Justin Jackson (SF-Maryland) and the Houston Rockets drafting De'Anthony Melton (PG-USC) in the second round. Both Jackson and Melton are talented and could have been first round selections if it wasn't for injury (Jackson) and a scandal (Melton). This year, there were not any huge reaches. Every team made solid selections. Overall, this was a good and deep draft. But, there are a lot of talented players that need to take time to develop. Last year, we witnessed rookies who were able to step in and contribute right away. This year, there are only a hand full of players who are ready to start. It will be interesting to see how this year's class pan out, starting with the Summer League games, which now has more drawing power thanks to last year's class.